David enjoys the Flat Earth Kayak sail on a Quest LV. My friend David and I have been experimenting with kayak sails for nearly two years now. We are both keen sailors and windsurfers so it seems very natural to us to put a sailing rig on a kayak. Indeed when "sea canoeing" took off in the west coast of Scotland at the end of the 19th century, nearly all were fitted with sails. Note, those who fancy experimenting with a Mark I brolly, please wrap some pipe insulation round the handle. It is more comfortable to hold and when the inevitable happens and you let go, it won't sink! Sailing rigs on sea kayaks are not that common in the UK but are very big in Australia and New Zealand. We got in touch with various people over the Internet and have tried a variety of different rigs including the Pacific Action V rig (above). This is quite heavy and not particularly aerodynamic, although it is great fun downwind in a strong wind, it is not much fun in lighter winds and you really can't reach across the wind with it. The sheeting system, which adjusts the angle of the two masts is not exactly intuitive, unless you are dead downwind. The sail is also really just a flat triangle, with little shape in it. However, in a force 5 with a good sized swell, we got the old Aleut Sea II double up to a burst speed of 22km/hr by a mixture of paddling, surfing and sailing! Next we tried Mick MacRobb's Flat Earth medium sail from Australia. We have used these sails on long open crossings such as to Ailsa Craig, long lochs such as Loch Fyne, Loch Linnhe, Sound of Mull, Loch Sunart. We have used them in coastal chop in the Firth of Clyde to open Atlantic swell off the west coast of Islay and in winds up to force 5 and in strong tidal waters such as the Sound of Islay and the Solway. What we can tell you is that Mick's design is absolutely stunning. It's a proper sail, made by an expert sailmaker, as any sailor/windsurfer will see by the way the roach is bending off nicely towards the head of the sail in the bottom photo. This twist gives the sail a very broad range of usable wind strength, which other sails, without a sailmaker's skill in shaping, simply can't match. All the fittings such as the mast, the mast foot and the goose neck have all been custom designed for the purpose and are not simply bits adapted from yachts and dinghies. The battens are even sewn into the sail with just the right amount of tension, saving you more guesswork using a tensioning strap. The deck fittings are easy to fit using a drill, bolts and washers. On some kayaks you might be very lucky and not need to drill too many holes, because you can use existing recessed deck fittings. You don't need a rudder to steer with Mick's rig, you raise the skeg and it points up into the wind and you drop the skeg and it bears off downwind. You don't need outriggers either! We carry on paddling when using the sail but in a force 4 you can expect to make about 9km/hr on a broad reach without paddling. So far the maximum we got on a GPS burst speed was 23km/hr sailing and surfing downwind on a broad reach. With a sailing rig you don't wait for the right swell, you overtake them then take your pick! 14km/hr is an easily achievable speed in force 4 to 5 and 9km/hr at the bottom end of force 4 and, again without paddling 6-7 km/hr in a force 3. When broad reaching or beam reaching, paddling has a synergistic effect, increasing the apparent wind, so sheet in and go! We did not experience a "death roll" with Mick's rig though we did with the Pacific Action V sail. If anything, the Flat Earth sail steadies the kayak in difficult conditions. 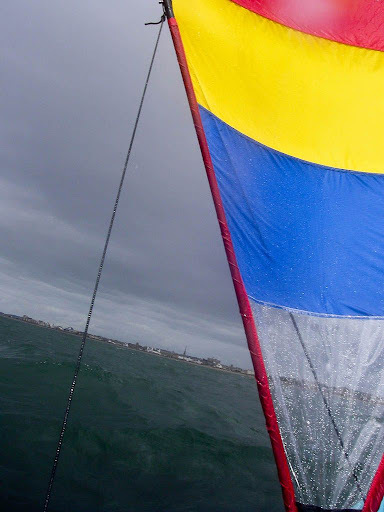 The sail won't beat into the wind, so tacking only happens if you want to change direction, round a headland say. We found if you raised the skeg but kept sheeted in the kayak would gently nose into the wind, the sail would depower and a couple sweep strokes would get the wind filling in on the other side of the sail. Downwind, gybing was easy using stern rudder/sweep strokes to turn the nose of the kayak through the dead downwind position. Because there is no kicking strap, the boom rises during the gybe, depowering the sail so there is little risk of capsize and the gybe is a slow, gentle sequence. You can speed the boom on its way over with a deft flick of the paddle on the sheet and then the gybe will happen more quickly. However, you need to have sorted out in your mind before hand how and where you will put in a quick brace, if required. The V sails are really downwind only but as you can see in the above photo, you can close reach with Mick's Flat Earth rig. 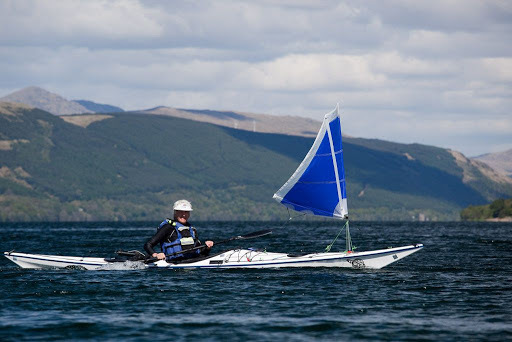 Kayak sailing is a really dynamic and exciting activity so watch this space, our little group will soon have 5 of Mick's sails. Once my knee is better and I can get round a bit easier, anyone who fancies a shot would be most welcome to come along on one of our trips. You will need to swap kayaks as some of the rig fittings need to be bolted to the kayak. 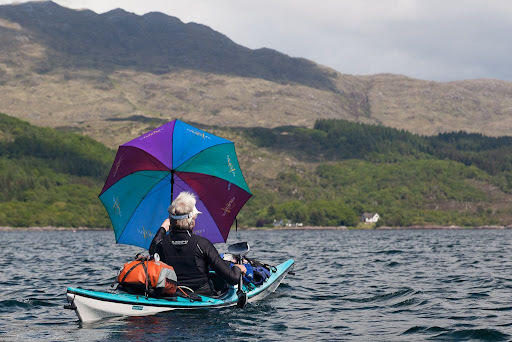 I really can't understand why there is so little interest in sea kayak sailing in this country. There is not a single mention in Gordon Brown's otherwise excellent book Sea Kayak. I am not a great one for sea kayaking badges but as far as I recall, there was not a single mention of sailing rigs in either the 4* or the 5* syllabus either. Friends have suggested that this lack of interest in the UK is because previous rigs have basically turned your simple sea kayak into a complex, heavy sailing boat with outriggers etc. and then you end up sailing instead of paddling. That is clearly not the case with Mick's rig which is quick to rig, light, simple and an adjunct to paddling, just as catching a swell is. Others have suggested it is because your kayak must need a rudder because a sailing dinghy needs one. That is clearly not the case, a skeg helps but we have used the sailing rig quite happily with the skeg kept up. Another concern is capsize and entrapment and when I started using sailing rigs I did have my knife to hand! I am not worried about entrapment because in Mick's design, all the lines are well forward of the cockpit. There are two control lines, an uphaul to pull the mast forward and up (when it then becomes a fore stay) and a sheet. Both are connected to the mast or sail by shock cord so there is some give, in case of gusts. With the rig up, control lines are all out of the way of paddling/rolling paddle arcs so you are free to carry on paddling. The sail can be raised and lowered very quickly. When rolled up on deck, they are very unobtrusive and are unaffected by rescue practice. You can roll with the sail deployed. I have not tried this yet myself, because of my knee injury but here is a rolling clip on Gnarly Dog's blog. It is actually quite easy to prevent a capsize because, at the speed you are going at in windy conditions, there is a huge amount of lift generated by simply trailing a paddle blade out to the side in a static low brace position. Once my knee is a bit better I will get back to testing and hope to submit a full review and long term test to Ocean Paddler magazine which will also appear here after the magazine has been published. At the moment there are no UK dealers and you need to order direct from Mick but I hope that very soon a well known UK dealer will start to import and distribute these really excellent sails. I am afraid this preview can only give you a brief idea of these sails's abilities and because my knee operation got in the way, much of it is through the experience of others. What I can say is that I have literally been blown away by these sails and I can't wait till my knee gets better enough to give them a thorough long term workout! I have posted detailed fitting instructions for Flat Earth Kayak Sails here. Tom three sails have just arrived from Mick please see UKRGB PM for my phone number so we can sort out sail colour and what chandlry you need! Hey Doug you should have a look at the kayaksailor rig. That's a propper sailing rig, not like that Aussie toy you have been playing with. Great blog, you sure have a great coastline over there in Scotland. Brad it is good to hear from you. I looked at the kayaksailor rig before choosing Flat Earth. The Kayaksailor rig is one of those things that turn your kayak into a dinghy. It is complicated and at over 10kg is not something I would want on my foredeck. Even the large volume American poly kayaks to which it was fitted in the publicity photos are nose down! How would you do a T rescue on a kayak fitted with one of those? Even folded there is a huge windage on deck which I would not like to have if caught out in strong winds. Also I think the sail area is a bit big for the average winds we paddle in in open waters here in the UK. In contrast the Flat Earth rig is simple, light at 860g! It does not interfere with rescues and with some practice you can roll it. I accept that the leeboards might get a few more degrees to windward but at 40 degrees without leeboards the Flat Earth is pretty good. I think the Flat Earth area of 1sqm is perfect for sailing in open water. I am not denying that the kayaksailor rig sails well (it is even priced well). It is just that its weight and complexity have no place on my sea kayaks foredeck! Great report on a very good product. 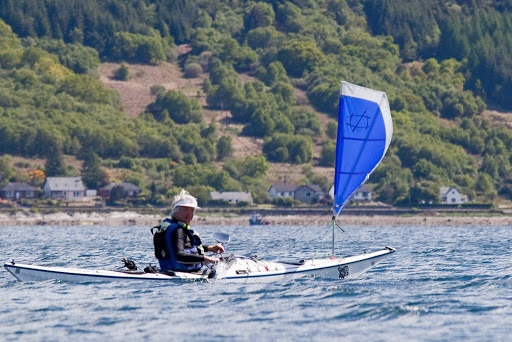 I know Mick well and use one of his sails to add to the experience :-) Compared to the overweight and overly complicated "kayaksailor" that Brad mentions so discretely it is a superbly simple and effective aid to covering distance and having fun at the same time! Good to see the word is getting out. Thanks for adding your experience Brad. I have a V-sail (Pacific Action) - it is strictly downwind indeed, beam reach at best (only possible with added leeboard). There is also Canadian sail called Spirit, which is worse than PA.
Mick's product is excellent, I wish FEKS company all the best. People in NSW have been making these sails for their own use for years, but I'm glad that now it is available to order, finally. 2) Can be lashed to the boat temporary without drilling holes, but this is neither quick nor reliable attachment. There is a lot of parts in KS, and therefore many things can go wrong (some are mentioned in the videos - they are honest people). Mast-lifting ropes might fall off the pulley in the bow end of the rail; top half of the mast might not slide along the bottom half; mast car might not slide along the rail; goal posts can break. Suggestions to FEKS company: more numbers. Mast length, sail area for Small, Medium etc. More info on those parts that proved to work well - mast material, mast base (hinge) etc. Because it leaves impression that you have not tested enough yet (even if this is not the case). People in UK, US and Canada are spoiled (I know, I live there) - they want a finished product with all the parts - like PA, KS or Spirit. Hello Alex thank you for your interesting and helpful comment. You are quite correct the KayakSailor rig is 4.5Kg. That was my mistake. Even so it is still over 5 times heavier than the FlatEarth rig that goes to windward without leeboards. Thanks for the links to the videos that I watched with interest. The KayakSailor rig is very full and appears to have little twist. These features will give it a lot of drive in the sheltered inland locations that were shown in the videos. I suspect the Flat Earth sail will be slower in light winds but it really comes into its own in windy exposed waters. Last Sunday, I took a Flat Earth rig out to Ailsa Craig which is 16km out in the middle of the Firth of Clyde.On the way back east we had a F3-4 NW wind and some surprisingly lumpy seas. The Flat Earth was in its element, I think a full sail would have been overpowered and uncomfortable as the kayak accelerated and decelerated on the waves.I am also concerned about how much windage will be generated by the stowed KayakSailor rig on the foredeck. The stowed Flat Earth rig is almost flush with the foredeck. Lastly, the Flat Earth rig is very much minimal engineering compared with the KayakSailor. The Flat Earth mast is a simple anodised aluminium tube. The mast foot/universal joint is a urethane tiller extension joint from a racing dinghy. It is highly functional design and is very well proven. I have had no problems in over 1000km. In Australia the rigs have covered countless km, they are very well tested and developed indeed! Flat Earth sails will be available in the North America through Columbia River Kayaking. I apresiate your coments, My web site is laking , and I havent the ability to update it and maintain it properly , in the near future I will be geting it updated with new designs that have just been lornched and more info on size and a new section on indavidul fitinf to popular kayaks. the design consept of Flat earth is simplisity and functionality , all my designs have ther heratige from NSW and Tasmanian sea kayaking , Blue water and conditions that change rapidly , after coments from a long term youser on a resent Bass Strait crosing the need for refing has to be looked at , not a simpal thing when keeping within the design consept of simplisity . thay are designd to have a lot of twist (about 18%) so thay can be yoused on a brord range of conditions. ther is a newer sail , the TL with a smaller arier and a fuller cut with less twist sune to be released after im hapy and others triling it are happy. 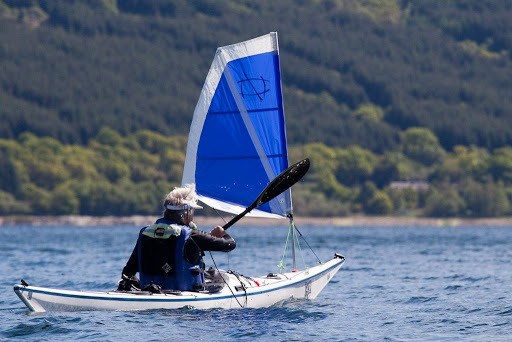 If you wont sumthing a bit more like a sailing dingy and les a sea kayak I recomend my compeditors, Kayaksailor and Bolger sails , ther realy well enganeard and im shore ther suport is good to . and on anuther good note , flat earth sails will be avalabel in North america through flat earth sails north america very shortly , im about to send of the 1st load of sails this week. I have used Flat earth sails for 3 years and love them. We commonly reach 20km an hour in medium to rough conditions. I never miss those waves, that I use to when I didn't a sail.The best aspect of the Flat earth is its simplicity. If you have ever been caught in a squall, you would appreciate how quickly you can drop a Flat earth sail. (great safety feature) Keep up the good work Mick, your sails are world class. Hi Mick, I could not agree more. My recent maximum burst speed was 24 km on a really great wave. The real beauty of the Flat Earth rig is being able to use it downwind in decent fast waves that are otherwise too difficult to catch. Hello, I have a Perception Sierra kayak that I would like to add a sail to. The kayak has an excellent tracking hull & pronounced keel at the stern, but it is only 338 cms long (11' 1"). I'm considering making a sail & improvising a mast before I splash out on a Flat Earth or Falcon http://www.falconsails.com/ just in case it won't work with my boat. I live in Dorset with possibilities of sailing in East Anglia & Argyll (rarely). I don't want to add out-riggers, rudders etc to complicate things. What do you think? Thank you for you advice. Will source some dense foam. How close to the wind could I expect to sail in the Sierra? A close reach would be great, a beam reach still helpful as our onshore breeze is from the southwest so I'm always going to need to sail close to it wherever I end up going whether I'm on my outward or return journey. That said, I suppose I can ask my wife to collect me from wherever end up, but a return journey would be nice if it were possible. Do you have any pro or cons regarding http://www.falconsails.com/ ? Now that you mention it, how close can one reach upwind with a flat earth sail? Falcon claims 30 percent if everything it set right. Don't know... any one with this experience? And how about Flat Earth?